Lynskey ProCX frame on VG sale. Also a few gravel frames and bikes. They mark down huge when they do. But the ProCX is a good 650b candidate IMO. BB not too low for it. ... gearing. I too, think D2R2 is probably best suited for 1x! There’s rarely any flat section more than 30 seconds long! There’re however, tons of steep ups and downs follow closely together! I found myself constantly double shifting. More over, many of the climbs changes gradient abruptly, necessitating “sweeping” over multiple cogs in a hurry in my rather “conventional” cassette of 13-32 (9 speed). So a somewhat larger gap is actually an advantage. But Dave’s point of other use is also valid. Went out for a short easy ride, 1st ride of 2019. I need a new bike, to replace my 15 year old road bike. But I’m too busy riding (or skiing) and have no time to go test riding new bikes. Having own the Crosshare for 20 years, I will not go back to a road only bike any more. A cross/gravel bike will do EVERYTHING a road frame can except in weight & speed. With lower gears available thanks to the 1x craze, I can climb with a heavier bike without running out of gear. This is all you see here. Disc road and gravel bikes with 28s. Make sense to me, no trips to the LBS for new rims after one or two rainy seasons being the biggest plus. Stick on 28s and ride with the club, pop on your gravel wheels with 35-45 tires and even do some single track, and or race CX. It is the closest to a one bike solution thus far is seems. If your shop is also a Cannondale dealer I wouldn't really look at the Super X for your needs as that is a straight ahead CX bike, have a look at the Topstone or Slate those are both very nice bikes. The shop is also a Cannondale dealer. I'll look at the Topstone, don't know if I'm there with the funky fork on the Slate. Though the more I look at it, the more I think a Checkpoint with 1x is really what I want, just may not be the most cost effective choice. 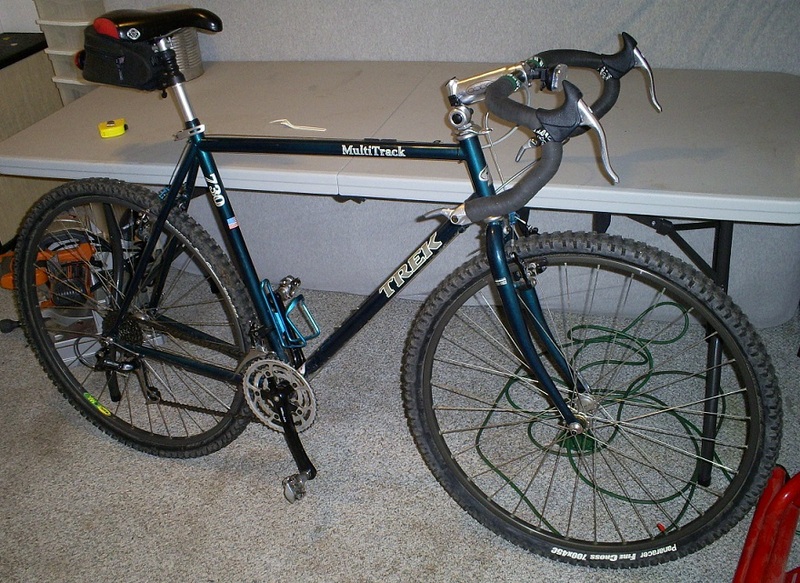 All the integrated Trek stuff like racks, fenders and lights is attractive as it would also be a great commuter bike. Battleship bland gray or Cobra Blood? And a little less BB drop than the Domane @ 7.4 VS 7.8. I noticed that the SL 6 still has a 500 OCLV, same as SL 5 and not OCLV/6 Series. Unlike the Domane/Madones that the Series always went Series_4=400, 5=500, 6=600 etc. "I guess another possibility is a Cannondale Super X, which seems more af a cross bike but has one model with a wide range 1x11." Linda absolutely loves hers, both for 'cross racing and gravel riding. For the latter, we put an 11-36 cassette on it (works fine) and we just ordered a Wolftooth "CAMO" spider and a 36-tooth chainring to give her 1:1 gearing for our upcoming gravel rides. Nobody makes a 36-tooth direct mount ring and the CAMO system will allow us to easily change her gearing using relatively inexpensive chainrings, rather than dealing with the headache of changing direct-mount rings. BTW, she got her bike from The Pro's Closet and I highly recommend them to anyone looking for a used bike. Her's was a former team rider's bike that was essentially like new, for well under half of the original price. They even replaced one of the tubulars that came on it when we complained that it wouldn't hold air (a $$$ Challenge Baby Limus). They run a first-class operation. "Nobody makes a 36-tooth direct mount ring"
Won't the SRAM CX1 Spider fit the CADO arm? Also SRAM has a Direct Narrow Tall with the same spline as the spider, is it going to fit a the CADO, same question I guess. I have a Spider and Narrow Tall 38t. Well, I have a few spiders and 1x and 2x setups. I had bought 3 CX1 cranks. I have a few extra 110x5 Spiders, if that fits would open up you chainring. Each crank arm sets came with 100 spiders. I could not resist the Force Level Carbon crank arms for 95.00 each. Super low Q factor. I signed up for Rockingham. Assuming I get in enough shape to ride it half decently, maybe I’ll see you guys there. Does 650b wheels, a gravel bike make? 47x650b Teravail Cannonballs. "Won't the SRAM CX1 Spider fit the CADO arm?" I could be mistaken, but my understanding is that SRAM spiders and rings won't fit on C'dale Hollowgram cranks. "I signed up for Rockingham. Assuming I get in enough shape to ride it half decently, maybe I’ll see you guys there." Here is a great option. "Went to the shop today and spec’d a Checkpoint with SRAM 1x11, they’ll price it out and get back." Ordered the Checkpoint with Force 1. Should have it in about a week. A little more expensive as a custom build, but exactly what I want. Red. @Brian, I’ve ridden Raid Rockingham and you’re right, it’s not hard for a gravel ride; I’m just not in much shape as I haven’t been riding any distance for over a year. But it gives me some incentive and if I can ride it OK I’ll take that as a step toward D2R2 (all of the 4 versions of D2R2 I’ve ridden are considerably harder than RR). "Ordered the Checkpoint with Force 1." Curious with the CX1 cranks how close to the chain stays the crank arm will be, them very low Q factor. @Sparky, I dunno what the crank is like, though I assume it’s carbon and it works. It looks fun except it’s in spring. Too early for me. Otherwise, $400 for 2 nights with meal, and 2 days semi-supported riding is a good price by any standard. The fact the money goes to conservativon, even better. While we have a Gravel Bike Thread, I'll pop this here in this thread. Decided to sell the Conquest when I saw a nice Lynskey Frame on one of their stupid sales. My 2015 Strong as example with 8CM drop. I don't like to put smaller than a 32mm with 700c. Carl keyed frame toward a 40mm 700c. This 2019 Pro Cross has 6.56CM BB drop, like normal CX bike should/would? Carl set me up with a left over fork for dirt [in more than one way, dirt $ and dirt use]. With an IS disc mount it is not an item he'd put on a current build. Fed-x dropped off the frame & headset yesterday. I got it into a SS mode to ride, liked what I felt and popped on a 1x11 11-36 with a bar con. Not decided what the final iteration will be, mainly shifters wise I mean. I ordered a shiftmate and am going to try SR ERGOs with a GS Shimano DR and see how that goes. Enjoyed it as a 1x11 today fine. I like Bar cons personally, especially in the cold/rain with heavier gloves like todays shake out ride. But the 28'42 CX1 SRAM cranks [off Conquest] are on to stay. Love this combo. I got it out on some wet hard pack and slimy woods trails in the rain today for an inaugural jaunt. You're really getting a grip on what "gravel" is all about! Can you say where using tires bigger than say 35mm is much help on a drop-bar bike? Other than sand that is. I dig the mongrel look of the Lynsky, perfect for an era when people are still figuring out what a Gravel bike is supposed to be and do. I've done a lot of mtb riding on touring bikes with ~30mm tires, so to me that's gravel riding. 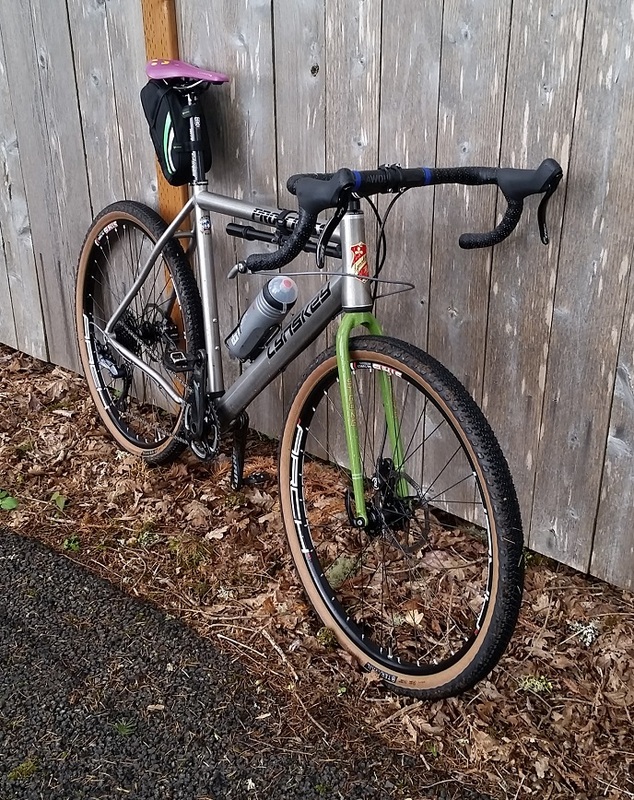 I used my CX bike with 33mm tubeless tires and canti brakes on Sunday's 60-mile Fondo ride here in the foothills, and can say that the platform makes an excellent road bike other than that it can't draft a lead rider closely without tires touching. And of course I already know that tires smaller than this size are adequate for off-roading. I guess it's the added cushion of bigger-yet tires that makes them marketable, but it's still not what I could call suspension. One big limitation that I see on today's gravel bikes is that they offer no auxilliary brake levers with the full-hydro brakes. It's a serious deficiency imo for technical descending, and needs to be addressed somehow. When you are heavier/bigger and need flotation in soft/loose, well me. I need a tire that won't cut like a knife. If I was 145 lb a 32 would be fine perhaps. I ordered some 11s Bar cons, I wanna keep the Hylex for a while. I agree with your assessment on no top aux levers for juicies. I keep looking at the TRP carbon CX AUX levers hanging on a hook on my parts wall thinking "wish these could be incorporated". "I dig the mongrel look of the Lynsky, perfect for an era when people are still figuring out what a Gravel bike is supposed to be and do. " At least the mongrel aspect. In case you actually get a sizable tax refund . . . . . . Battery pack in the seat tube, eh?